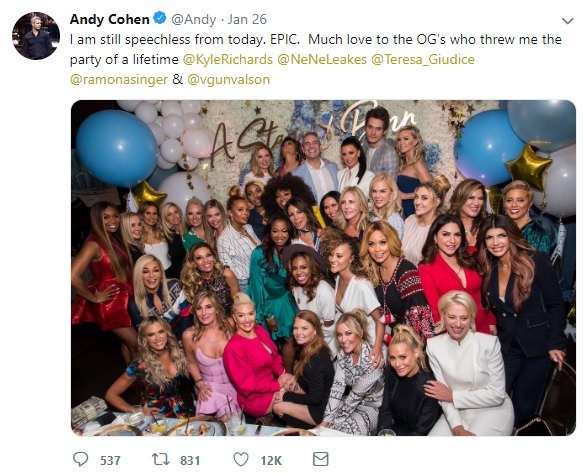 iRealHousewives | The 411 On American + International Real Housewives: The Real Housewives Take Over Andy Cohen’s ‘Epic’ Baby Shower; Get All The Tea On Who Showed Up, Who Didn’t And More — See Pics Here! Over the weekend, a massive event took place in L.A.as all the Real Housewives stars from all across the nation came together to celebrate Andy Cohen's baby shower. Many celebrities were in attendance aside the ladies of Bravo including Cohen's good friend John Mayer. "It was the Marvel superheroes all coming together under one roof," Andy, who is expecting his first baby via surrogate, said on John Mayer's Instagram Live talk show, Current Mood, on Sunday night, according to E! News. Mayer added, "And imagine the Marvel superheroes all come together under one roof and John Mayer also shows up." The event took place on Saturday, January 26, which took place in Beverly Hills at The Palm. 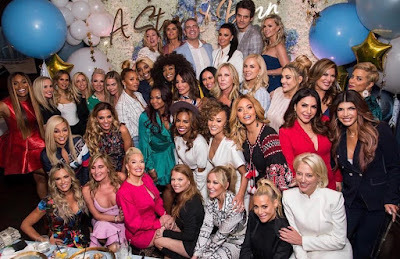 The shower theme was "A Star is Born," and was hosted by several OG Housewives: Kyle Richards (RHOBH), Ramona Singer (RHONY), NeNe Leakes (RHOA), Teresa Giudice (RHONJ) and the OG of the OC, Vicki Gunvalson (RHOC). "I am still speechless from today. EPIC," Andy wrote on Twitter. "Much love to the OG's who threw me the party of a lifetime." Apparently, it was Kyle Richards and NeNe Leakes who were in charge of the guest list. "It was really Kyle and NeNe who were in charge of the guest list," a source told E! News. "They had the most say." So which Housewives made it to the shower? The Real Housewives of Atlanta: Cynthia Bailey, Eva Marcille, Marlo Hampton, NeNe Leakes and Phaedra Parks. The Real Housewives of Beverly Hills: Camille Grammer, Denise Richards, Dorit Kemsley, Erika Girardi, Kyle Richards, Lisa Rinna and Teddi Mellencamp Arroyave. The Real Housewives of Dallas: Brandi Redmond, Kameron Westcott, LeeAnne Locken and Stephanie Hollman. The Real Housewives of New Jersey: Danielle Staub, Dolores Catania, Jackie Goldschneider, Jennifer Aydin, Margaret Josephs and Teresa Giudice. The Real Housewives of New York City: Dorinda Medley, Ramona Singer and Sonja Morgan. The Real Housewives of Orange County: Emily Simpson, Gina Kirschenheiter, Tamra Judge, Shannon Beador and Vicki Gunvalson. The Real Housewives of Potomac: Ashley Darby, Candiace Dillard, Gizelle Bryant, Karen Huger and Robyn Dixon. Bethenny Frankel revealed on Twitter that she couldn't make it since she "had a speaking engagement at the same time :("
Luann de Lesseps was busy on tour with her #CountessAndFriends cabaret show. Luann shared a meme on Instagram, before posting the epic group photo. "Look at all the aunties this baby has! What a great looking crowd!" she wrote. "@bravoandy you will be a great dad!" Lisa Vanderpump was in Las Vegas prepping for the opening of Vanderpump Cocktail Garden at Caesars Palace. On SiriusXM's Radio Andy's Monday episode, Andy revealed LVP Face-Timed him during the party, saying, "You know I love you," and that she reminded him she was the first person to give him a gift. Kelly Dodd was on vacation in Aspin. Dodd revealed on Instagram that she was invited but she already had her trip planned months in advanced. Kandi Burruss is currently competing and locked away inside the Celebrity Big Brother house. Melissa Gorga posted on Instagram that she was at her daughter's cheerleading competition in Dallas. Tinsley Mortimer is currently in Palm Beach, where she is spending the winter. While she was invited, she opted to stay put, a source told E! News. Cary Dueber posted on Instagram that was on a girls' retreat at Mii amo in Sedona, Arizona. Andy revealed on Radio Andy that Porsha Williams is too far along in her pregnancy to travel. However there hasn't been word as to why D'Andra Simmons from RHOD, Monique Samuels from RHOP and Shamari DeVoe were MIA. Andy spilled the tea during a recent episode of his radio show and apparently the Gerogia peaches "shut the room down." "When NeNe, Cynthia Bailey and Marlo arrived, they shut the room down just with their entrance." He later added, "There were gasps" when they arrived. He also named Cynthia, who rocked a bright yellow suit, as the best dressed attendee. As for the ladies from Dallas and Potomac, Andy admitted they seemed happy to be invited and "a little bit in awe" of the more seasoned cast members. "They respected the queens." Meanwhile sources revealed to the outlet that, "It so much fun for the different cast members to hang out...no drama," with Teddi Mellencamp also telling a fan on Instagram Stories that there was no drama and all of the Housewives "were there having the time of our lives," it seems like there might be some tension following the shower...with Andy revealing one fight between Teddi's co-stars. Andy revealed that Dorit Kemsley and Camille Grammer were arguing at one point, but Andy advised them, "Ladies, shut it down, save it for the reunion." Lisa Rinna, who infamously stood on the table, grabbed the mic and yelled, "Dance like your f--king life depends on it!" She then ordered them all to dance for Andy because he "paid for your life." Aside from Mayer, Jenni Pullos from Flipping Out, celebrity couple Jerry O'Connell and Rebecca Romijn were in attendance as well as comedian Amy Phillips. However, the cast of Bravo shows such as Vanderpump Rules and Shahs of Sunset, which are both set in Los Angeles, as well as Southern Charm, Below Deck and others, were not included on the guest list. "Keeping it to mostly Housewives only helped keep the guest list under control. The issue with inviting other shows is, if you invite one, you have to invite them all," the insider told E! News. "So if they invited the Vanderpump Rules cast, for example, they'd have to invite all the Shahs of Sunset. Housewives is Andy's baby and most of them are mothers and it just made the most sense."